It's now 2011. I have not updated this page since 2000. Back then we were known as "Model Boats by John Into". Although Nancy's name wasn't on the site back then, she has been working with me on models since about 1993. I've been making models since I was 7 years old, which means that I've been doing it for just under 50 years. I guess that means that we've been doing this for a while now. Let me say that Nancy and I have been together since 1979 and it seems that those things that we've done together, have always turned out well. Our latest collaboration of note is our book about scratch building models - "Fundamentals of Model Boat Building". Throughout my life I have been surrounded with philosphies of art and engineering and boats were always present in some way, shape or form. My mother and sister are professional artists, as was my grandmother. Due to their understanding of the importance of art I attended various art classes throughout my childhood, learning about painting and sculpture and these teachings were reinforced during summers spent with my grandmother. My father and brother are both professional engineers. My father began my education in drafting and very basic principles of design in my early teens. 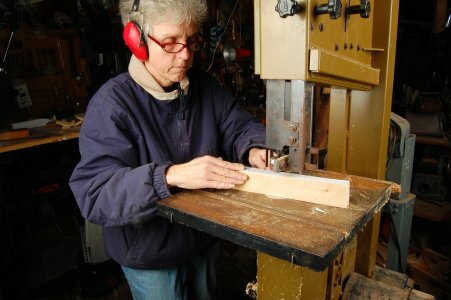 I studied basics of woodworking and metal work in high school and apprenticed in general carpentry and cabinetmaking in Vermont. My father's father held a Masters License and was probably the person that taught me the most about boats. We learned recently that my great grandfather, the first "John Into" was reputed to be the last living person to hold Unlimited Master's Licenses in the U.S. and Great Britain. My great uncle, was the first boat modeler that I can remember. His models taught me the meaning of "scratch-built". I have also been a professional musician and attended the Berklee College of Music and have a BS in Psychology from Boston University. Nancy was brought up by parents who were artists and artisans, her mother always making new creations to sell at various shows and her father was a New York Ironworker. I know that I learned a lot from both of them. Nancy is often asked if I "...make the boats and she paints them?" I get annoyed after hearing that question too many times. Nancy carves, runs large equipment, and virtually every other aspect of making models and is a highly skilled model maker in her own right. The only things that I do that she doesn't involve design work. We now live on Maryland's Eastern Shore between St.Michaels and Tilghman Island. It is a beautiful place, generally quiet, with rockfish, bald eagles, osprey, great blue herons and wonderful views over the water. Being avid boaters, in addition to making models of them, it is a great place to be. This is an area where some boats are still made of wood; more of fiberglass, but a place where the knowledge of building boats is still prevalent. There are several boat-builders within hundreds of yards of our workshop who have given us wonderful insight into local boat design and history. Some of them are third generation, and possess rare knowledge. 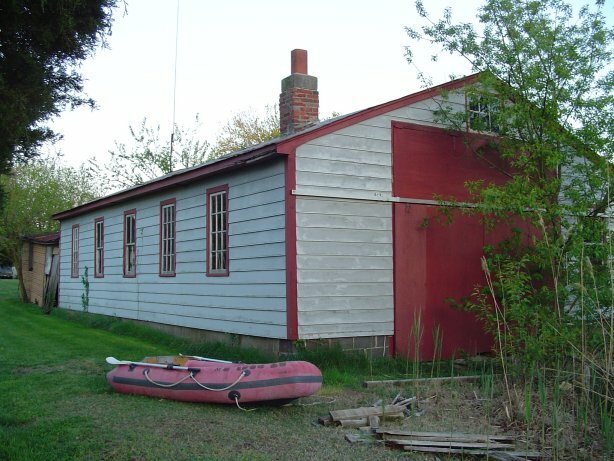 Our shop is in a boathouse, formerly "Jones' Boatyard", which operated for the majority of the 1900's. It once had 3 piers, 2 marine railways and a general store. It still has 2 piers and both railways, although one is unserviceable and the motor was removed from the other before we arrived. The building is famous locally for having been accidently bombed following world war II. It has wonderful character and is an ideal place for making boats, even if they are much smaller than those made 50 years ago, which were as large as 43' long. Unfortunately, Orval Jones, the last generation of Jones to run Jones' Boatyard, passed away a couple of years ago. There aren't many of the old style boat builders left anymore. Our old boathouse went through another trauma a few years ago during Hurricane Isabelle. Parts of our shop were under four feet of water and we were out of business for three months. 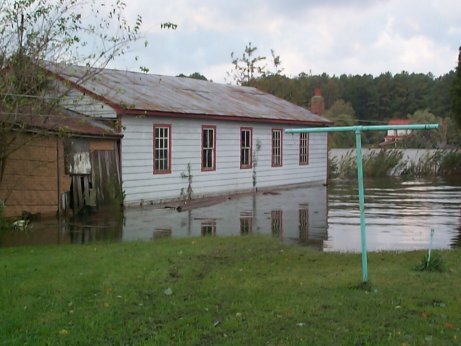 After Isabelle's storm surge had subsided. In addition to our experiences here and in New England, we have traveled throughout this country and Canada and have always made it a point to learn about regional boats. Our library of information and photographs about various boats has become quite extensive. We have been filing away large amounts of data about boats for a long time. We are always learning new things. 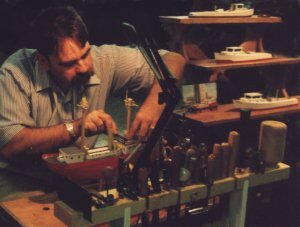 We began making models professionally in 1993 and since that time have made over 300 model boats. In that time we have become very involved with the Chesapeake Bay Chapter of The Antique & Classic Boat Society. 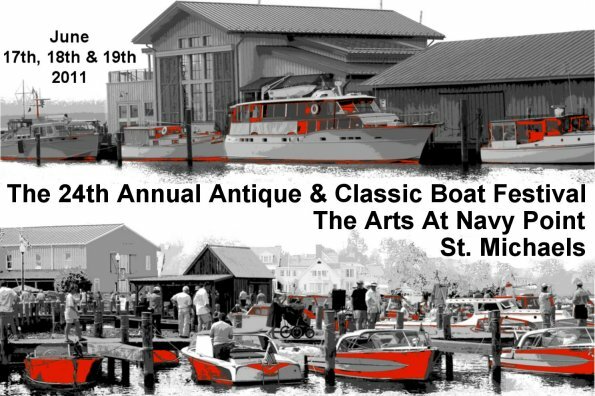 We are the Vendor Chairs for the "Antique & Classic Boat Festival" and "The Arts at Navy Point" held every Father's Day Weekend at the Chesapeake Bay Maritime Museum in St. Michaels, Maryland. If you like boats and/or art I recommend that you join us on that weekend. It is the largest antique & classic boat show of its type in the Mid-Atlantic region. This year we will be attending a number of shows in Maryland, Florida, Upstate New York and Virginia. Check our shows page for specifics. Come see us. We love to meet new people.